Last week, anti-government protests in Europe increased, in particular in Serbia where tensions between the ruling party and anti-government protesters have heightened. A limited number of demonstrations were also held surrounding the Ukrainian presidential elections. 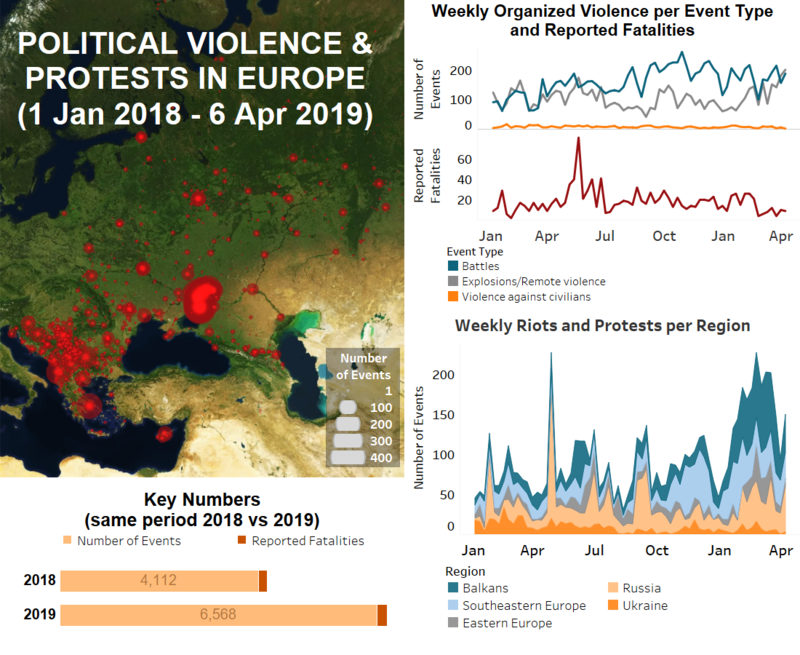 Anti-government demonstrations in the Balkans, Southeastern Europe, and Eastern Europe increased last week, after several prior weeks of decline. In Montenegro, anti-government demonstrations continued, with one demonstration leading to a clash among rioters and two serious injuries. In Albania, weekly national demonstrations against the government continued, marked by clashes between demonstrators and police. In Moldova, Guagazia region, protests were held against changes in the electoral law, and in Chisinau protesters demanded prosecution of police brutality. Anti-government protest events in Serbia also increased last week, after a significant drop in the week prior, with a major protest rally held in Belgrade on April 13. Supporters of the ruling Serbian Progressive Party (SNS) held demonstrations blocking local government buildings in at least two cities. Tensions between supporters of SNS and the anti-government “1 of 5 Million” movement increased, with several attacks on both sides reported last week. In Ukraine, leading up to the second round of the presidential elections scheduled for April 21, the number of demonstration events increased slightly. The National Corps Party staged another protest against President Petro Poroshenko and corruption in Ukraine’s defence industry. In central Kiev, scuffles took place between supporters of Poroshenko and Volodymyr Zelenskiy as thousands rallied in support for either presidential candidate. In the Donbass region, fighting between Ukrainian government forces and separatist rebels continued at similar levels to previous weeks. Other than the above key developments noted above, throughout the Balkans, Southern and Eastern Europe, demonstrations against labour- and environmental practices and various other issues continued. In Belarus, weekly protests against a car battery plant in Brest continued, but has expanded to protests against police arrests of local activists as well. In Bosnia and Herzegovina and in Kosovo, members of the Romani ethnic minority protested, demanding more rights and protection by the institutions. In Bulgaria, hundreds of rioters demonstrated, clashing with police and setting two Romani houses on fire in response to an earlier incident where three Romani men beat up an ethnic Bulgarian man. In Greece, anarchist group activity increased last week. In Athens, there were two consecutive nights of violence in addition to other attacks against riot police in anarchist stronghold Exarchia. In Thessaloniki and Athens, anarchists held various demonstrations, using violence in several of them. In Russia, the minor surge in Communist Party of the Russian Federation (KPRF) protests last week centered around the party’s leader, Gennady Zyuganov, who is embroiled in a legal battle with the oligarch Oleg Deripaska. Regional protest events increased in number, but attracted relatively small crowds. The protests took place on April 10 and 11, coinciding with the second hearing of the case against Zyuganov on April 11. In the city of Tyumen, southwestern Siberia, an armed clash took place between the police and alleged Islamic State militants, leading to the reported deaths of both alleged militants. In Russia, such incidents involving the Islamic State are rare outside of the Caucasus region. © 2019 Armed Conflict Location & Event Data Project (ACLED). All rights reserved. Lennart Landman is the Research Manager for Europe at ACLED, where he oversees the real-time coding, weekly analyses, and the expansion of coverage into new countries. He previously worked as a researcher on European security and defence issues for the Clingendael Institute in The Hague. He holds an MA in International Relations and is a PhD Candidate at the University of Groningen. The Armed Conflict Location & Event Data Project (ACLED) is a disaggregated conflict analysis and crisis mapping project. 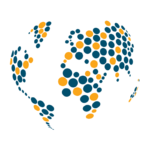 ACLED is the highest quality, most widely used, realtime data and analysis source on political violence and protest in the developing world. Practitioners, researchers and governments depend on ACLED for the latest reliable information on current conflict and disorder patterns. Please contact admin@acleddata.com with comments or queries regarding the ACLED dataset. © 2019 ACLED. All Rights Reserved. Web Design by Egg. To download all ACLED data for the entire time period of coverage, simply click ‘export’. To download all available ACLED data for a specific time period, simply enter a date range and click ‘export’. Please be aware that ACLED covers over 80 countries, but the period of active coverage differs. For African states, all data are available from January 1st 1997 onwards. For other countries, more recent periods are available and the details for each country can be found here. To download realtime and historical data for specific event types, choose in that category and leave all other categories as they are. All data for that event type will be exported. To download realtime and historical data for specific actor type or actor, choose in that category and leave all other categories as they are. All data for that event type will be exported. To download realtime and historical data for specific region, country or location, choose in that category and leave all other categories as they are. All data for that event type will be exported. By default, the data are exported in a format where each row represents an single event, on a specific day and location and involving distinct actors. A actor based file has events by single actors, meaning that events are often repeated if two actors are involved. The difference between the two file types is based on whether the data are being used to analyse patterns over time, types of violence, conflict between groups, or locations (which the normal file type is best for), or to analyse actor types or specific actors, when the “actor-based” file is best. Many guides to, and details of, the data use and coding processes can be found on the resource pages. Please note exported data will contain additional columns including a timestamp column which indicates when the data were last updated. For systems that use semi-colon separated values by default you may find the compatibility mode option beneficial.